I think the single most discussed topic in our town and many others, especially before any elections is taxes. It certainly was a heated debate in the past few months. It was explained and as you can see from this tax notice that Hazlet only sees 23.40% of the total taxes paid and the increase on the Hazlet line this year was approximately $40 to the average homeowner. So most of us we could deal with this small increase…but look at the other line items below and see why your taxes have risen. On closer examination of this tax bill we see the other distribution of our tax dollar and this is what is disturbing to many. When it was announced that all homes in Hazlet would be reappraised, many of us where concerned. We were assured that this may not have a significant effect on our taxes because the tax rate (2.628 percent) would also be adjusted to compensate for the new appraisals. Appraisals are done every 5 years, they appraise 20% of the homes in our county each year. So it would take 5 years to come back to yours. If you have received your new Tax Statement you will see that your taxes have risen, which we all expected. The shocking part of the statement is how much of our tax dollars are going to education. It was high when it was 56%, but now it has risen to a whopping 61.11%. In addition those long time residents of Hazlet who purchased their homes many years ago for $20-50,000 are now finding that same home has an appraised value of $250,00 and must somehow pay the higher taxes on the unrealized capital gains or the new appraised values. Older and many young homeowners are moving to adult communities or out-of-state because they simply can no longer afford to pay their taxes. Real estate taxes are tax deductible, but only for those that have income. The complaints from many of our seniors and those that are working hard to cover their living expenses is that they have no tax benefit from these deductions. Those that are in the higher tax brackets will benefit, those that are in the lowest have virtually no benefit from these deductions. You can get a federal tax deduction for the state and local taxes you pay on real estate that you own, such as your main home, a vacation home or bare land. Commonly (although incorrectly) called “property tax,” this real estate tax is paid directly to the tax assessor or through an escrow account set up by your mortgage company. Federal Funding for all schools. The “No Child Left Behind” Act requires states to develop assessments in basic skills. To receive federal school funding, states must give these assessments to all students at select grade levels. The Act does not assert a national achievement standard. Each individual state develops its own standards. 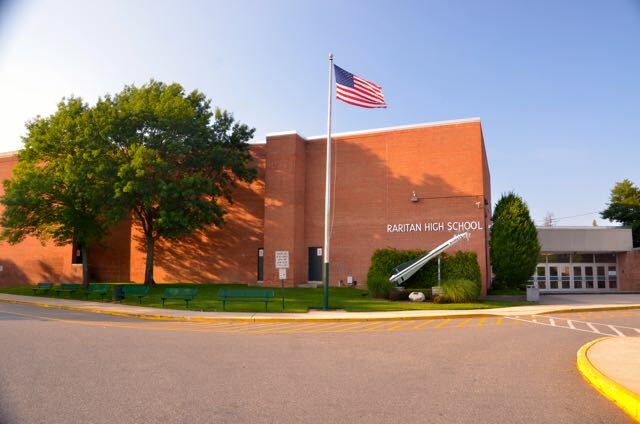 We understand the need for good schools which attract young home owners to buy homes in Hazlet, but there has to be stronger budget constraints on the cost of the educational system in our town. Is the tax money actually going to schools for specific programs or to hire more teachers or is it going to pensions and bloated administrative costs? We all must understand that there are pension programs that were also supposed to be funded to cover these pensions over the years, but as many of these pension programs are struggling today. The shortfalls in the pension funds must be made up and this could be part of the reason our education tax budget is so high. Pension programs are supposed to invest in safe financial opportunities and they should expect growth to help fund their pension program. However, the financial crash has been a hard hit for these pension investments. What they expected to see as a return on these funds, has in many cases produced no returns or may have lost money during the financial meltdown. One other item, we talk about Legacy Costs that were basically unfunded pension benefits that also must now be covered. So understand that your Education tax dollars are not for the education of your children, but to cover years of costs for unfunded pensions and shortfalls from state support as well as increased costs. “There are a variety of reasons DB (defined benefit) pension plans have persisted in public education. The most obvious factor is strong teacher support. Unquestionably, teachers unions have vigorously advocated for generous DB retirement benefit plans. A largely overlooked factor is that education administrators, the “stewards” of the system, are enrolled in the same plans as teachers. This is typically not the case in large private-sector firms, where senior managers have their own retirement benefit plans. As we document below, the rule structure in educator pension plans, combined with the career-cycle timing of teachers’ promotions into administrative positions, results in senior management in K–12 education enjoying the largest net benefits from these plans. Homeowners Pay For Education, Do Renters Pay Too? You Bet They Do! Some people have brought up the subject of homeowners paying the real estate taxes for all school children. They may think that those that rent do not. This is not the case. When you rent an apartment or home, the landlord has already included his costs for the real estate tax into his rental fees. So even a renter should be concerned about real estate taxes because his rental costs does include these taxes. We should all be concerned not just the homeowner. I am not claiming to be an expert or have the answers to these problems, but if we don’t find some solutions fast, these taxes will continue to rise and we can expect to pay more in taxes each year for education costs. 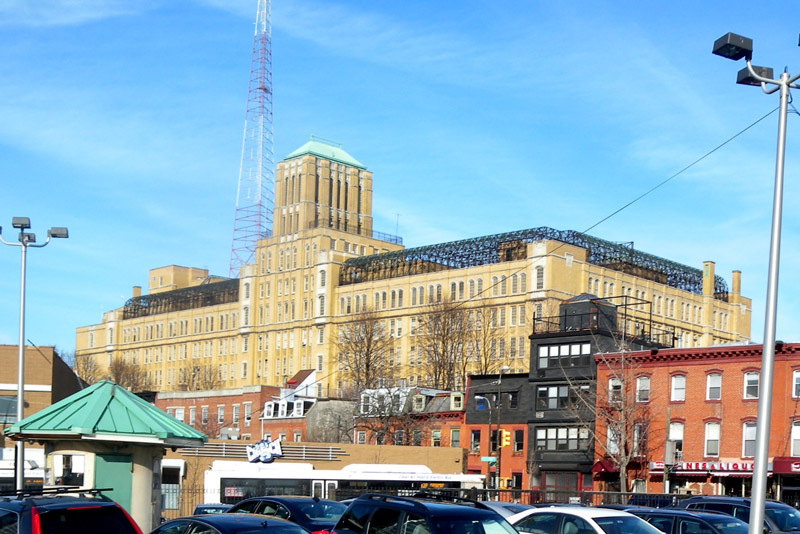 I attended a special high school Brooklyn Technical High School in New York. New York had 4 of these schools for gifted students when I was in High School in the late 1950’s. Brooklyn Tech, Bronx H.S. of Science, Stuyvesant H.S. (Math) and the High School of the Performing Arts. Now they have even more. See this article on Wikipeadia for more info. I had to take an advanced placement entrance exam to qualify for Tech and when accepted had to take a bus to the subway station to get to school each day. I had to commute about an hour each way to get to school. It was worth it and in order to get all the technical courses and shops I needed for my mechanical course high school degree. I had to attend summer school two summers to get all the academic subjects and the technical ones needed to graduate. I original goal was to graduate Tech and go to college and become a mechanical engineer. Unfortunately, our country entered a war in Vietnam. I decided to enlist before I was drafted in the Army National Guard. You can read more of that story here. In addition to New York City’s special schools we also had a number of vocational schools to prepare students who didn’t expect to go on to college. Those that wanted to become auto mechanics or go into the trades might have gone to Grady Vocational High School in Brooklyn. My cousin went there and was able to get a job on graduation and had a very successful career inventing a number of ultrasonic medical devices. These schools were free to residents of the City of New York for those that qualified. Maybe we need to rethink our educational programs and follow New York’s lead and offer students other options, other than our current system offers. Consolidate the schools, offer special schools for those that qualify to attend them and have free vocational schools for those students who may not want to, or can’t afford college. Give our students a free education and teach them skills that will enable them to get a real job after graduation. Now there are many new concepts in the education field from Charter Schools to Private schools, but the current public schools that depend on real estate taxes to cover their costs are becoming a burden on many families. I have said this my entire life, college is not for everyone and in so many cases graduation doesn’t guarantee that a student will find a job. The one thing it does guarantee for many students and their families is debt. Is it right to pay high taxes for education and then have our children and their parents buried in thousands of dollars of debt that may never be paid off? Enough is Enough…not everyone needs to go to college. Lets stop this madness now and start to think outside the box once again. 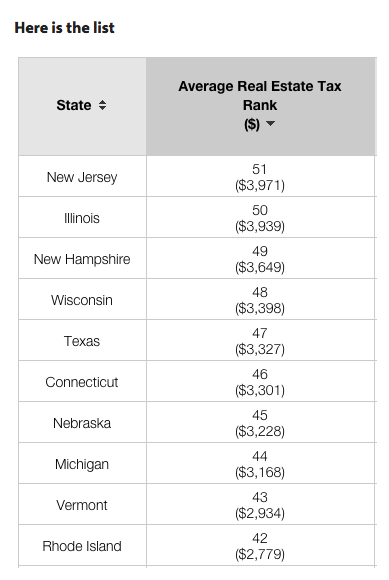 How Does NJ Rate On Taxes Compared To The Rest? Not a surprise, New Jersey has the highest real estate taxes in the United States. Now one reader said, people that moved to New Jersey already knew this. Well, that is not the truth, because many of us moved to New Jersey many years ago, I moved here 43 years ago and I can tell you that the taxes were not an issue back than. So to that reader who may not have issues paying taxes, I would say, look beyond your own financial situation and look at the thousands in our state and of course in Hazlet that have lost their jobs, are retired living on social security or pensions or the many that are disabled. Let us not forget the many young homeowners that must have two incomes to raise their families. We must think of the total population and not those that are one of the one percenters (a member of the top one percent of a population by wealth). Hazlet and some of our neighboring towns are made up primarily of hard-working people. This is not a wealthy community and our town doesn’t have any major corporations as Holmdel does that covers many of their tax burdens. So for us, we must insist that our town and state government find better ways to help keep our taxes in line with the rest of the country. Paying almost 62% of each tax dollar for education, can only mean even more in the years to come as more and more teachers and administrators retire and begin to collect their pensions at 60 years old and collect pensions for the rest of their lives, which today could be 20 to 30 years. You can see the full pension program and requirements in this fact sheet from the New Jersey Division of Pensions and Benefits. We must begin to search for solutions to lower our taxes and keep the educational budgets inline or we won’t be able to afford any education for any child in the future. Although I can’t find the reasons at this time, I did discover a list of states and who received the most and the least amount of Federal funding. Not hard to realize why we take top spot in the highest taxes, when you see that we are also the first on the list of states that have received the least amount of Federal dollars. Click here to see the entire list. Again, I am not sure why, but one would think that our politicians are simply not fighting enough for us in Congress and are passing the financial burdens onto our states residents and businesses. Why should we not receive our fair share of federal money? Well, states that have military bases will receive more funding, those devastated by natural disasters also receive this funding, so it is hard to compare all states in this case. However, there are states that have lawmakers that fight for these and other projects in their state. The projects that bring jobs and money into the state. Apparently New Jersey is not one of them and the closing of Fort Monmouth didn’t help much either. Note: The amount appropriated in the State Budget for property tax relief programs affected reimbursement payments for 2014. Applicants were eligible for 2014 reimbursement payments if their income did not exceed $84,289 for 2013 and $70,000 for 2014, provided they met all the other program requirements. Applicants whose income was over $70,000 but was $85,553 or less can establish their eligibility for future reimbursements by filing an application by the due date. This also ensures the Division will mail them applications for 2015. In the past few months you saw many posts by one individual that said the seniors and disabled couldn’t afford any tax increases. At that township meeting I explained that there was relief under the Senior Freeze program. However this person kept yelling what about those that were disabled as she was. As you can see from the information above this program covers both seniors and the disabled. So the reason I am once again writing about taxes here is I wanted to remind all my fellow retiree’s and those that are disabled to take advantage of this program. Read the eligibility requirements and by all means file. They have extended filing through October 2105, so be sure to do so. If you feel your home was appraised above current values in our area. The above map shows recently sold homes in Hazlet. Click on it for more information. Once you have found the same or similar homes to yours and the selling prices are lower than yours, you can contact the Hazlet Tax assessor for more information on how you can challenge the new appraised value of your home. If you do find other similar homes that were recently sold for less you can of course request a readjustment of your homes appraised values. I know that the identical home to mine sold recently for $45,000 less than the appraised value of my home. If I wasn’t on the Senior Freeze program I would probably do some research find other comps in my area and then ask our towns tax assessor Gail Scaglione to help me out. You may want to do the same. Gail is a wonderful and compassionate woman who took time explaining all this to me some months ago. 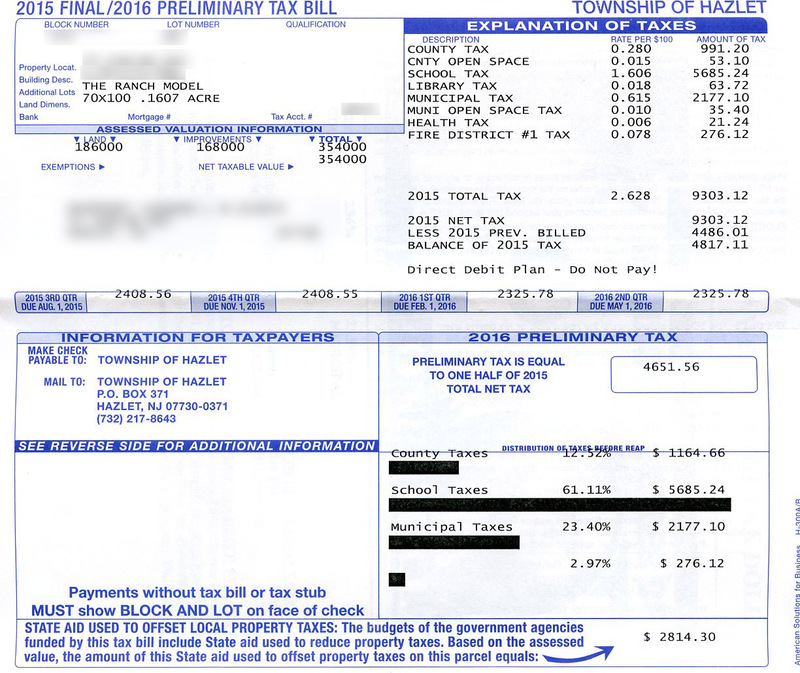 Remember, Hazlet has no control over the taxes or the total budget, only its 23% portion of your total tax dollar. I hope this article helps you understand where your tax dollars are going and why. There are options and I have listed them here, take the time to find out more and you too can help bring down the costs of your taxes now. Remember, the Hazlet News website will continue to post new articles to help our residents, not only on maintaining ones home and increasing its value, but on many other relevant topics. So keep coming back to see whats new. Can We Be Constructive Rather Than Destructive? It’s just great, other than the street improvements, what else had been done. Plus, 61% tax for a school system I don’t even use. THATS THEFT!!!!! In my development there are 2 different homes, Most of us have the same house. I live on a corner and my evaluation is $355,00. My neighbor across the street, has the same house, all upgraded like mine, inside and out,only one difference, I have a porch, they have a large deck, they have been evaluated at $294,00!!! My taxes are over $9,000!! No one came into our homes to evaluate, just did it from the outside. Other neighbors around this house that is evaluated at $294,000 who have the same house, who have no upgrades are evaluated for more that them…something is wrong in this evaluation system. Down the street from me same home but much more upgrades, 2 car garage, back of home all blown out to make the home bigger,their evaluation is almost near mine???? They have been there for many many years.There is NO fairness in the evaluation system. I am a senior and it is hard to pay the school tax. I am tired of paying health insurance for the teachers and their families. I have to pay my own from MY husbands pay check,YES he is still working, 2 jobs to afford to stay here, cannot retire. Our children and grandchildren are here. Seniors should NOT have to pay school taxes once they reach retirement age. I have friends in other states, that once they reached retirement age NO MORE SCHOOL TAX. Its not like our schools are way up there in evaluation, the English SAT and Math SAT score ranking is horrible. Now they put a program in the Middle Schools to help prepare certain students for College. Should they NOT be preparing kids for college anyway, without this new program, Is this not their job? No wonder so many teachers in our school system who have children send them to CATHOLIC SCHOOL, they know whats going on in the school system. They know their kids will get the education they are entitled to. Hazlet is not the greatest school system in the state nor the country. Why are our school taxes for HIGH?? In NYC and the boroughs, there is only 1 Superintendent for each bouough . It should be the same here. 1 Super for each County. We could save so much money. Get parents involved in the school system and give them a tax credit for their help. Give Seniors a break,,NO MORE SCHOOL TAX! !